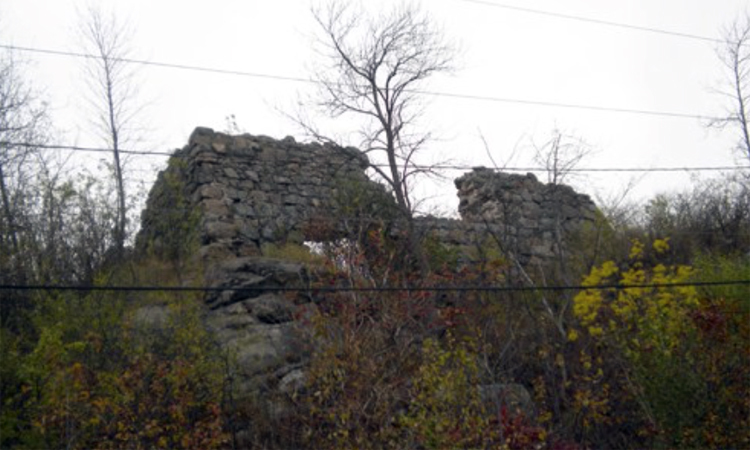 The ruins, between Tenth and Eleventh Avenues west, are the remains of Duluth’s first water reservoir, built over a natural spring from which eight barrels of water flowed every day. The reservoir was constructed in 1884 by the privately owned Duluth Gas & Water Company when the area was known as “The Glenn” and populated mostly by French immigrants, who built St. Jean Baptiste Catholic Church at Eleventh Avenue West and Superior Street in 1885. In 1898 the city acquired the reservoir as it began constructing its present water system, which draws fresh water from Lake Superior at the Lakewood Pumping Station and delivers it to reservoirs throughout much of the city. (The far western portion of the city is supplied through artesian wells.) The city did not incorporate the 1884 facility into its new system. A Duluth News Tribune story on August 12, 1940, states that “there is no written information available concerning the use of the reservoir.” At one point the facility was used to grow mushrooms, an enterprise that failed. Its original flat wooden roof reportedly was destroyed by fire in 1912. In 1918 the property was sold to J. M. Corcoran and became known to locals as “Fort Corcoran.” Corcoran had an opening cut in the reservoir for a doorway and built a set of wooden stairs leading to it from First Street. Workers had to burrow through more than 14 feet of solid rock to make the entrance. Corcoran, from Hibbing, described himself as “a dealer in everything that lives” and planned to convert the reservoir into a “miniature Noah’s Ark” where he would breed birds, “fancy dogs,” pedigree cats and “many other things that purr, bark, scratch or bite.” He planned to install a roller rink on the second floor—after he built the second floor—but also thought he could turn that space into “thirty-two commodious rooms for lodgers.” He would locate the kitchen above the spring so the structure would have its own water supply. He also considered plans to add a third floor for lodgers. Unfortunately, we don’t know if Corcoran’s plans panned out for him, nor is it known when the wooden additions Corcoran made to the structure were removed.